Bahrain, Taiwan (China) and Ecuador top list in annual survey. Vietnam has been ranked 14th among the best countries for expats after InterNations drew on its 3.2 million members and surveyed over 18,000 expats from 178 nationalities living in 187 countries or territories. The best countries for expats were ranked by InterNations as part of its annual Expat Insider Survey. According to the latest report on atlasandboots.com, there are an estimated 57 million expatriates across the globe, with the term “expat” no longer limited to corporate employees relocating from a company’s headquarters. Instead, more and more expats are moving overseas in search of a dream. Some have remote jobs and are now working from a location they love. InterNations’ latest survey looks at how expats’ motivations for moving are changing where they go. InterNations used its members’ answers to rank 68 destinations on how expat residents feel towards their home away from home. The survey uses 48 individual factors that influence an expat’s experience of living in a foreign country, including safety and security, family life, finances, travel and transport options, ease of settling in, and average working hours. 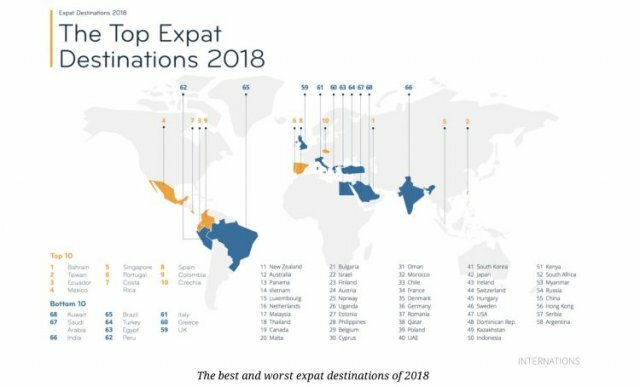 Bahrain, Taiwan and Ecuador were ranked as the three best countries for expats in 2018. Bahrain received high scores for making expats feel at home and is popular with expat families. Taiwan, up from fourth in 2017, was ranked second, with expats citing a high quality of life thanks to affordable healthcare and good transportation infrastructure. After ranking 25th out of 65 countries in 2017, Ecuador moved up to third in 2018. The impressive improvement is down to excellent results regarding finances, ease of settling in, and expats’ work-life balance, though it should be noted that a large proportion of respondents are retirees (46 per cent). Additionally, more than four in five expats in Ecuador (83 per cent) rate their financial situation favorably. While there has been change at the top of the rankings, at the bottom it’s the usual suspects. Seven out of the ten worst-rated countries were already in the bottom ten in 2017.